Cucuta: US Secretary of State Mike Pompeo ended his tour of South America on Sunday with a brief visit to the Colombian border city of Cucuta, crossed through by thousands of Venezuelans fleeing crisis under President Nicolas Maduro. After attending a Sunday service in the Peruvian capital Lima, the chief US diplomat set off for the final leg of his tour of South America, which began Friday in Chile. “I hope that you will care enough when you see the horror, when you see the tragedy, to change your ways and to leave your country.” Branded illegitimate by over 50 countries, who instead recognise opposition leader Juan Guaido, Maduro closed four frontier bridges connecting Venezuela and Cucuta on February 22. All four countries featured on his itinerary — Chile, Paraguay, Peru and Colombia — are led by right-wing or center-right leaders favourable to Washington’s uncompromising approach to Maduro. 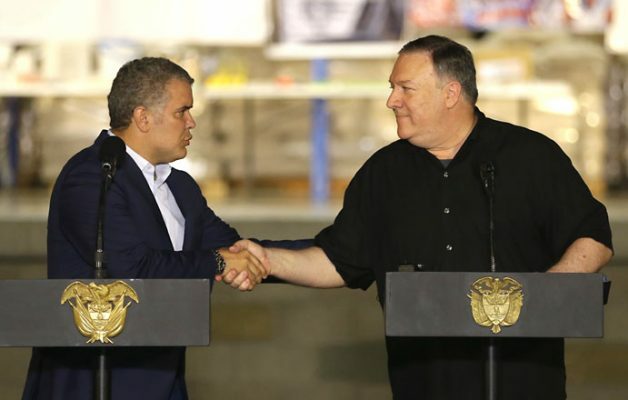 On Saturday, Pompeo paid tribute to Peru’s welcome for hundreds of thousands of Venezuelan refugees. He added that Peru had shown “enormous leadership in responding to this challenge.” Over three million Venezuelans, around 10 per cent of the population, now live outside the crisis-hit country, ravaged by shortages of food and medicine and repeated power outages.